I visited a new location today, the Goose Lake State Recreation Area. And what a site. Standing at the outflow of a small creek I saw 211 Caspian terns, 61 Forster’s terns, 54 gulls, and two white-faced ibis. I had been searching for potential foraging locations used by Caspian terns making extended trips away from the nesting colony, an island 34 miles to the north in Crump Lake. 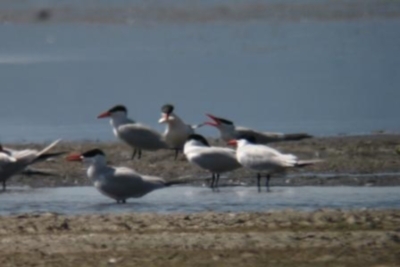 This was the largest group of Caspian terns I had seen all day. I began surveying for color-banded terns to give me a clue as to these individuals’ origin. Then I saw a peculiar sight. A Caspian tern dipped its head under the water and came up with a fish: a Tui chub, 18 cm long. The tern walked along the spit with the fish, posturing at others, and finally flew off heading north. As I resumed scanning, another tern dipped its head into the water and came up with a 15 cm Tui chub. This fish was quickly consumed. As I scanned, I found more and more terns with fish, but they seemed to be acquiring them in the most unusual manner; these terns weren’t making plunge dives from the air to catch fish as they normally do, but lazily reaching out from a standing position or jumping up and flapping their wings to catch their prey. These plunge diving birds were feeding like wading birds. The pliability of animal behavior, what an amazing sight! Unfortunately no banded birds on this visit. It will be something I can look forward to discovering next week when I return.